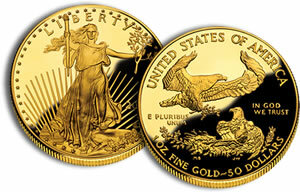 CoinNews.net speculated earlier this year about the production chances for 2010 Proof American Gold Eagles. Throw past speculation out the window. The United States Mint is already producing and will sell four different sized proof Gold Eagles later this year, U.S. Mint spokesman Michael White confirmed Tuesday, September 7. However, 2010 Proof American Silver Eagles are still in question. An exact date is yet to be announced but the one-ounce, half-ounce, quarter-ounce and tenth-ounce proof 2010 Gold Eagles are expected to launch in mid-October, according to White. The bullion one-ounce version has been available since January 19, 2010, with the fractional bullion sizes released on June 10, 2010. The collector proof coins have taken a backseat to the bullions, as the Mint is required by law to strike them in quantities to meet public demand. The 2009 proofs were canceled as a result of surging demand that cut into the available supply of coin blanks. Blanks are the metal discs used in minting coins — the same blanks are used for both the bullion and collector eagles. While bullion coins continue to move at a brisk pace, bullion Gold Eagles sales have not been at unprecedented levels this year. Recent figures are most telling. In August, buyers grabbed just 41,500 ounces of the 22-karat gold coins — down from 152,000 ounces in July 2010 and 82,000 in August 2009. Bullion Silver Eagle demand eased last month as well, but their numbers are primed to easily top last year’s annual record of 28,766,500. The U.S. Mint has already sold over 23.6 million between January 2010 and August 2010. As such, it still appears that proof 2010 Silver Eagles will see production only through congressional help, as U.S. Mint Director Ed Moy revealed in July. The top mintage levels for this year’s gold proof issues are set slightly higher than those that were pre-defined prior to the release of the 2008 Proof Gold Eagles. And like those from 2008, a portion of each size is reserved for inclusion in a 4-coin proof set. When compared to the table above, the Mint sold less than half of the maximum mintages for each coin in 2008. However, demand may be higher this year given collector anticipation and the fact that no proof eagles were available in 2009. The Mint will directly sell 2010 Proof Gold Eagles to anyone interested. Each coin will be priced on the Wednesday prior to their launch. Their prices can change weekly depending upon the prevailing cost of gold. The proofs feature a polished, mirror-like finish and the "W" mint mark, denoting their production at the Mint in West Point. As such, their premiums over gold will be significantly higher than the currently available bullion 2010 Gold Eagles. American Eagles have been minted since 1986. Unlike the collector versions which share the same designs, the bullion options were authorized by Congress as a means to "provide investors with a convenient and cost effective way to add a small amount of physical platinum, gold, or silver to their investment portfolios," as stated on the Mint’s website. The Mint sells all their bullion coins to a network of authorized dealers who in turn resell them to the public for a small premium over the current spot price of gold. 2010 Proof Gold Eagle Production Likely?